Dylan O’Keeffe has backed up his first Carrera Cup Australia race win with victory in the joint Asia/Australia Pro Race at a dark Sydney Motorsport Park. O’Keeffe took over the lead by the end of the first lap and was untroubled for the next 15 in the #88 Ashley Seward Motorsport car, finishing clear of David Wall (Wall Racing) in second and Will Bamber in third. Martin Ragginger (Team Porsche Holding) started from pole by virtue of the fastest lap in Porsche Carrera Cup Asia qualifying and the Thursday night coin toss which put the Asian series competitors on the left-hand-side of the grid for the Pro race. O’Keeffe took up fourth position on the grid and it was those two who made the fastest starts as they led Bamber and Wall through the opening corners. Ragginger handed the lead to O’Keeffe when he made a mess of the Turn 10/Turn 11 complex at the end of Lap 1, and the loss of momentum saw Bamber blaze into second down Brabham Straight and Wall into third on the run to Turn 2. Word soon came through that Ragginger’s start was in fact too good and the Austrian would have a five-second penalty added to his race time. 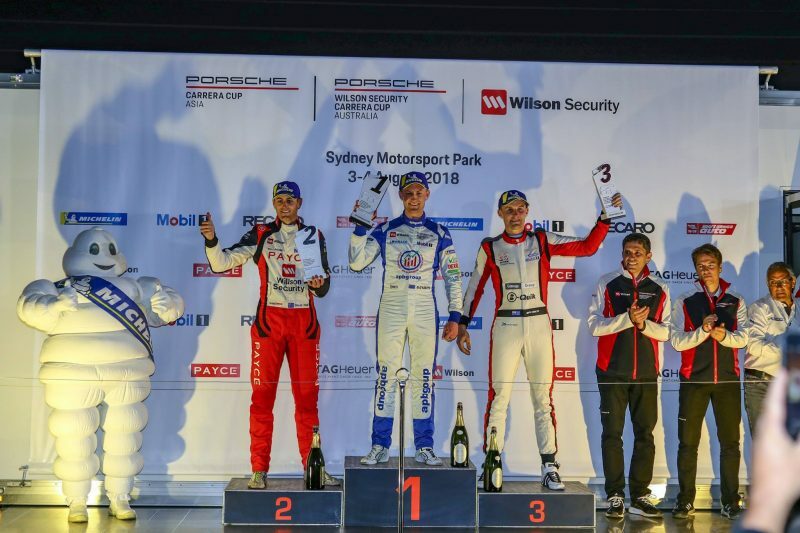 O’Keeffe gradually pulled away at the front and his lead peaked over two seconds with a lap remaining before he safely navigated his way to the chequered flag having broken through in Porsche Wilson Security Carrera Cup Australia around six hours earlier. Wall harassed Bamber for several laps and finally executed the pass when the #112 Earl Bamber Motorsport entry got crossed up into Turn 1 on the last lap. Ragginger had enough in reserve over fifth-placed Jaxon Evans (McElrea Racing) to retain fourth despite the extra five seconds. The day’s other maiden Carrera Cup Australia race winner, Jordan Love (Sonic Motor Racing), copped a drive-through for turning Philip Hamprecht (Team StarChase) around at Turn 8 on Lap 3 but ended up retiring anyway. Kiwis Evans and Chris van der Drift, an Asia competitor, leave Sydney with reduced leads in their respective title fights. Roger Lago won the joint Pro-Am Race in twilight conditions just prior. Lago got away cleanly from pole, while outside front row starter Bao Jinlong’s start was hampered by wheelspin in his initial getaway. An early Safety Car was thrown for Siu Yuk Lung, who swiped the inside wall on the exit of Turn 1 and had to limp off the track with damage to the right-hand-side of his car. Following the lengthy intervention, Lago led the field back to green flag racing on Lap 7 with Jinlong in tow. Adrian Flack began to pressure the Chinese driver before making a move into second place before Turn 10. The Safety Car was called once again at the halfway point of the race as Wayne Shen pulled over at Turn 3 with damage to his car after contact with Anthony Gilbertson. Stephen Grove pitted during the recovery after picking up a puncture from the debris while running in the top 10. Lago held his nerve when the race restarted again for a one-lap dash, crossing the line with a 1.3s advantage to Flack as Jinlong represented Asia on the podium. Gilbertson brought his car home in fourth ahead Shane Smollen, making it four Carrera Cup Australia cars in the top five. Earlier in the afternoon, Hamprecht executed a clean start from the front row and cleared out in the second Carrera Cup Asia race of the weekend which formed Round 7 of the season. Maxime Jousse battled his way up to second after an incredible double pass at Turn 1 in the mid-stages of the race, taking advantage of a duel between van der Drift and Ragginger. The latter ultimately finished third, ahead of Bamber and van der Drift. Carrera Cup Australia continues with Round 6 on the Supercars support card at The Bend, while Round 8 of Carrera Cup Asia takes place at the Singapore Formula 1 Grand Prix on September 14-16.